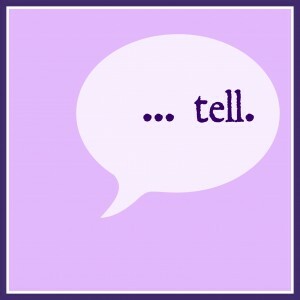 Five Minute Friday: Tell | spifftacular. Tell the world (or at least anyone who will listen) when you feel something so deeply it hurts. That’s what I did earlier this week, and I’m so grateful I have this blog to allow me to tell. Tell the world when you see injustice. That’s what people tried to do in Missouri this week. I hope the injustice turns into greater understanding and reform. Tell those you love that you love them. Cliche as it is, you never know when you’ll have another chance to. And sometimes, it’s better not to tell. Instead: think, and listen. The world will still be there when you’re ready to tell. Another awesome post Holly! Everyday I try to “tell” people things that mean something to me or spark a feeling in me. Sometimes it’s verbal, sometimes it’s re-posting/sharing something on facebook, sometimes it’s a package in the mail 🙂 and sometimes, quite often, it’s a silent prayer to Heavenly Father telling Him what’s on my mind or in my heart. I know I can do better though and trying to be that is a good thing. Love yoU! Love this one today. We all need to know when to tell and when to be silent. I work all the time on sharing those things which are most important and leaving those things which are not uplifting an edifying alone. Thank you for reminding me. Glad you could relate–thank you for visiting, Pattyann! Hey! I’m sorry it’s taken me so long to get to this comment. I read your stuff on Five-Minute Friday, but we left for vacation the next morning, so I’ve been reading it many times without opportunity to leave a comment. I love what you’ve done with the word, Tell. I love how you’ve captured moments that require us to tell others something and even, when we need to choose not to tell but to be silent and listen. Beautiful words with a powerful reminder. So glad I discovered your words through Five-minute Friday!